You don’t come to Cuba for the food. Well, you never used to come to Cuba for the food. Strict rationing, food shortages and far more serious issues on the collective plate for the last fifty years than fine dining led to the slow demise of culinary culture, and Cuba’s reputation for serving up some of the lowliest fodder in the name of food. But last year, after Raul Castro opened up the laws on running private businesses such as paladares – home restaurants – a new generation of gastronauts emerged, and currently leading the pack are the men in white hats behind Havana’s Café Laurent. We spoke for a few minutes about options, and then he recommended I try another restaurant around the corner. But Café Laurent was high on my list of tips to review for the GuidePal Havana City Guide I am working on, and I had little interest in going elsewhere. I explained the situation to him, but he wouldn’t budge. As he spoke, he was encouraging me down the street with a persistant press in my lower back that made me instantly uncomfortable. It was that, as well as his eagerness to leave his post outside Café Laurent that made me realise what he was doing. He was clearly on commission from the other restaurant to poach Café Laurent’s customers by pretending they were fully booked. I politely declined, and walked away feeling foolish, while he returned to his perch just outside the gate. Scoping him out from the other side of the street, I was now certain he was a jinetero – a Cuban hustler – and I just needed to find a way past him to get to my dinner. Short of a run and barge tactic, I had no idea how to achieve that. Entering a restaurant doesn’t normally require an exercise in subterfuge. “Excuse me, your colleague told me you were fully booked. Can you check there isn’t space for one more?” I asked feeling deeply uncomfortable that the young man was stood right there listening. “Do you know he’s trying to hustle your customers?” I asked once inside the adorable antique elevator. foreign money. They are Havana’s mosquitoes; the daily irritant that buzzes about you incessantly. The lighting was warm and atmospheric, the music trendy yet melodic, and the service superb placing it clearing in high-end territory. 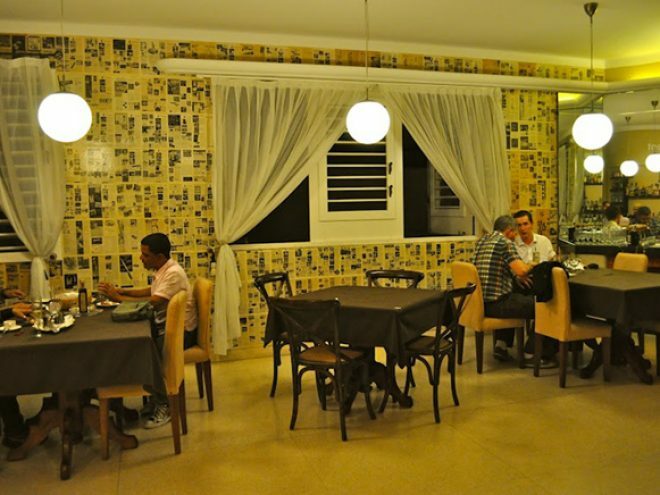 But then there were red herrings, like the bathtub in the toilets – a remnant of its former guise as someone’s home – and the comedy translations on the English language menu such as fish strips instead of fish cakes, which reminded you happily that this was still Cuba. I opted for the waiter’s suggestion and had cordero lechal a la tabaca – lamb slow-roasted with a garlic, cream and mint reduction. It arrived perfectly presented with swirls of green, white and red over a lamb castle with a decorative crisp protruding at a jaunty angle. It had all the elements of nouvelle cuisine, just twice the size. The lamb was perfectly tender falling away from my fork, and the flavours complemented each other deliciously without being over complex. I struggled to finish the plate, which at CUC 11 seemed like a good enough deal. A collaboration between Lorenzo Enrique Nieto and José Figueroa, their previous management of Havana Vieja’s one time star paladar El Templete fades in comparison to what they’ve done here, with a lot of thanks to chef Dayron Aviles Alfonso, who has worked in both San Sebastien, Spain and Buenos Aires, Argentina. Their efforts haven’t gone unnoticed. Every table was full with the stylish, dining-set of Havana, and no doubt tourists will be hot on their heels. With the gastronomic trend well in motion, since Café Laurent’s opening last year, dozens of other paladares have followed in their path, testimony to the culinary revolution currently sweeping the city.